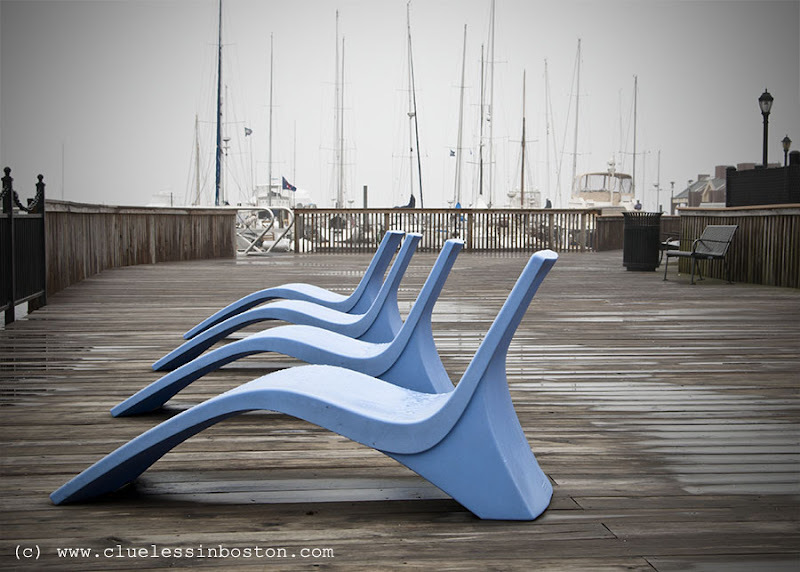 Empty benches at the harbor on a rainy, foggy day in Boston. I like the shapes and colors. A great image, and perhaps one for VP in Livorno? Same reaction as Gunn, I think VP would love these. They are fantastic, I've never seen anything like them. Are they fastened? Here I think they would disappear quite quickly if not. And I love your angle! What a great photo, love the soft pastel colours. Very strong shot. I am also one of those who frequently crops if I have not done it in the viewfinder. I would be tempted to crop the top horizontal along the top of the railings, but that's just me. Even on rainy day they look great! Beautiful shot! I love the soft blue of those benches. The seats of the chaises look like waves! This image was well seen and processed. Oh boy, this is really nice...one of your very best! Everything is so sharp...and the blue, or course, is just stunning against the gray background, that the dock and the sailboats - well, it's damn near perfect! Re your comment on The Villages: I don't live in The Villages, so am not allowed to play the Glenview Golf Course. I did play 9 holes on it in 2004 when we visited there...but it was so cold (December) I had to quit after the front side! Glenview is very expensive, too. But I do play some beautiful courses in the Ocala area, including our own course at Stone Creek. Excellent composition, Clueless, and remarkable benches. They seem so un-Bostonian, but it has been a long time since I have lived in Boston. It must be changing. Like Gunn, I predict this photo will find its way onto VP's bench blog. Very interesting. I like this shot. The chairs are like huge upside down women's high heel sandals, except without the straps...?